Tellurium(IV) oxide, also known as tellurium dioxide, is a chemical compound. Its chemical formula is TeO2. It contains tellurium in its +4 oxidation state. It also contains oxide ions. 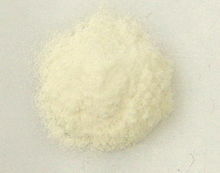 Tellurium(IV) oxide can be yellow or white. The white form is the manmade form. The yellow form is natural, also known as tellurite. The manmade form is most common in chemical reactions. At high pressure, the manmade white form turns into the yellow form. It melts at a high temperature to make a red liquid. Tellurium(IV) oxide does not dissolve in water. It reacts with concentrated sulfuric acid. It can react with many strong acids and powerful oxidizing agents. It can also react with strong bases. It makes one's breath smell like garlic when it is eaten. Tellurium(IV) oxide is made by burning tellurium in air. It is used in devices that can convert light into sound. It can make glass with special properties. It can cause birth defects. It also makes bad breath. This page was last changed on 11 March 2013, at 23:14.